When tropical storm Irene swept through Connecticut, Hinsdale Elementary School in Winsted was flooded. Months later, remnants of the storm remain in the form of mold. The school was tested earlier this month and higher levels of mold were found in the gymnasium, which doubles as a cafeteria, and there were lower levels in other rooms. One parent said her son, who is in fourth grade, developed a respiratory infection early in the school year. Since then, she's kept him home. "He's been out of school for, I believe, it's five weeks now," Melissa Asselin said. "He hasn't used an inhaler. He hasn't used steroids, hasn't taken an Advil. No nebulizer, no nothing. He's a healthy child." 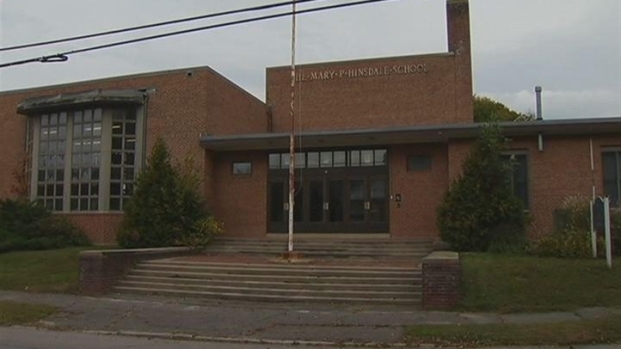 Parents are concerned about the cleanup of mold inside Hinsdale Elementary School in Winsted. Cleaning the mold from the affected areas could begin as early as this weekend, but that might be just the start of fixing a larger problem. Mold might have spread underneath the gymnasium floor. Resolving that could require completely overhauling the gym. "The long-term fix is taking advantage of whatever grants may be available from FEMA and so forth from the tropical storm we had in late August," Supt. Dr. Thomas Danehy said. An even more expensive fix might be the school's roof. It's 25 years old, more than five years beyond how long it's expected to hold up. Danehy says it's leaking in several spots, allowing more water into the school, bringing with it the potential for even more mold. Melissa Asselin said her son will stay home until air quality improves. "My son will not go back until tests come back that say that this building is OK, because it's not," she said.